Welcome To Bonnes Amies! 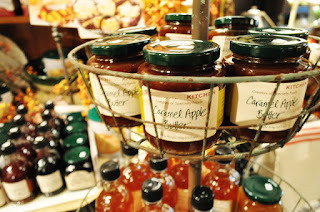 : CARAMEL APPLE BUTTER!! Say it 'aint so...Caramel Apple Butter has arrived a spoon full of this and I am happy the rest of the day. 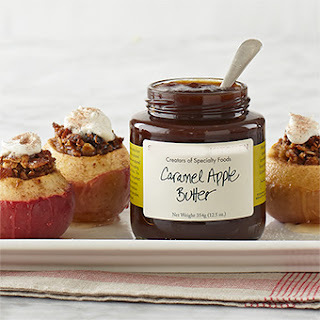 The sweet taste of a just picked apple combined with the decadence of caramel come together in our delicious Caramel Apple Butter. Let your inner inhibitions go and dip your apple right in! It's the perfect topping for your favorite ice cream, cake or pastry. Our kitchen is stocked for Fall come pick up some special items for your home! 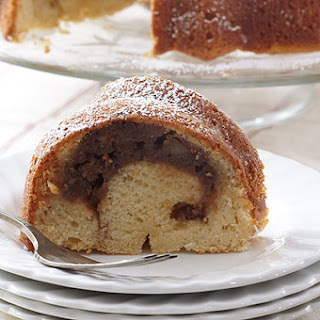 The flavor of a county fair favorite wrapped comfortably inside a cake. In a small bowl, combine all of the filling ingredients. Set aside. For the cake batter stir together flour, baking powder, baking soda and salt, in a small bowl. In a large bowl, cream the butter and sugar with an electric mixer until light and fluffy. Add eggs to butter and sugar, one at a time, beating well after each addition. Add the vanilla and beat until smooth. Alternately, add dry ingredients and sour cream into the resulting egg mixture, beating until smooth. Measure 1/4 cup batter and add to the filling mixture. Pour just over 1/2 of the batter into the pan. Make a 1-inch trough in the center of the batter all the way around the pan. Cover with remaining cake batter. Smooth around top, so the filling is completely covered. Bake for 40 minutes, or until the cake begins to pull away from the edges of the pan and a wooden toothpick inserted into the center comes out clean.